Remember, this isn't just about throwing some burgers on the grill, there are a lot of details that go into a dinner party. Guest List: This guest list will ultimately dictate everything else that goes into your dinner party. You need to pick the right people and avoid inviting people that might get into conflicts. Even more important is to make sure that each of the guests has something in common so that they get along well. There's no guarantee of course, but having a guest that doesn't know how to socialize and make new friends is going to throw everything off. Showing off Your Living Space: Often times, your first dinner party coincides with a house warming party. You want to show off your new digs and stylish new dining room furniture as well as other parts of the house. Remember though, your friends are going to be checking out everything and comparing it to theirs, so make sure you've got your stuff together and close off any areas that you don't want people to see! Food: While people will start making a judgement from the moment they walk in your door - food is the next step. For dinner parties between close friends this is probably less of an issue but if you are inviting work associates or new neighbors your food needs to send a message and tell people what you and your partner are all about. That means a careful balance between quality, creativity, and cost. Clothes: Sure, you are going to be running around like made moving furniture and sweaty from cooking, but make sure to take a break before people arrive so you can shower, shave and dress up. You don't want to be over dressed, but you also don't want to look like you stepped out of the yard to answer the door when guests begin to arrive. Cleanliness: This might be obvious, but do an extra careful job of cleaning the house. Again, people love to judge others and this first dinner party of yours is a trial to see if you can organize a great social event. If you live in a small house or apartment and the kitchen is tiny, you need to keep this in mind when you’re planning the food for your party. Try to find recipes that will work well within the constraints of your kitchen. Also, think about the supplies and cooking items you already have on hand. You probably don’t want to be out buying a new Kitchen Aid mixer an hour before your party starts, so try to work with what you’ve got. Make sure you read recipes carefully to make sure you don’t need something you don’t have. Look for recipes that will be flexible enough to allow you to make them ahead of time and store them in the refrigerator until it’s time to warm them for the party. That way, you can make some things the night before and take the last minute pressure off yourself. Also think about making items that can be left out at room temperature for a while and still taste good, because that might be what happens with one or more of your recipes as you’re greeting people, entertaining and attending to the other things that need to be done. Also important to note with the food is that you shouldn’t try to go too fancy. It’s best to choose recipes you’ve made a few times before to avoid any last-minute meltdowns. 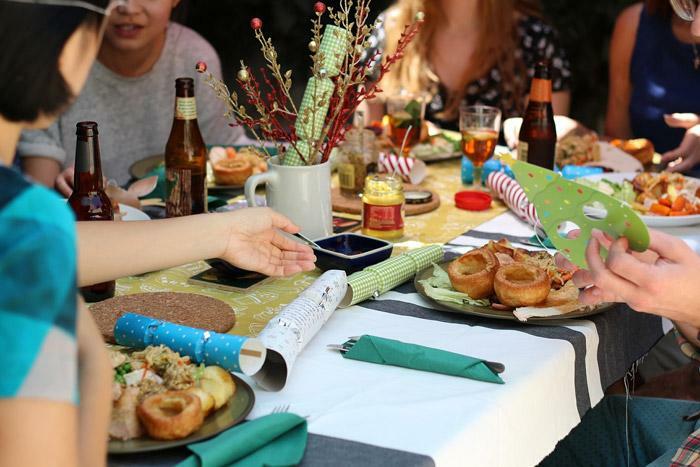 If you’re unsure of whether or not your guests have any food allergies or dietary restrictions, it can be embarrassing when the party comes, and they can’t eat what you’re serving. Send out a quick email when you invite them and ask them to let you know if there’s anything to be aware of. When the meal is over, you’re probably going to be ready to relax with your guests. Make this easier for yourself by cleaning as you go. Try to get the majority of the dishes washed while you’re cooking, and then don’t worry so much about cleaning everything right after the meal. The rest of the dishes can wait while you enjoy your guests and the success of your first dinner party. One thing that I've learned over the years from planning various events is that something will go wrong. There's simply no way to prevent accidents from happening but you are prepared (or should be). So whether that's a broken dish or an item that's a little burned - don't worry. The most important thing here is that you and your partner come across cool and in control of the situation. That will show to your guests that YES! you are truely an adult and have mastered the art of your first dinner party.